Tour will start after the training and safety instructions. Once you are comfortable and ready, the trip will begin in Ramales Square where will find the remains of the old church of San Juan Bautista, where one of the mayor figures of Spanish painting was buried, Velázquez. Passing by Plaza de Orient and enjoying the view of the statue of King Felipe the fourth with the eighteenth century Royal Palace at the back, we will reach the facade of Almudena Cathedral and enjoy its beautiful mix of styles. The next stop will be Plaza de España, where the monument to Cervantes stands surrounded by once the highest buildings of the city, the tower Madrid and the building España. 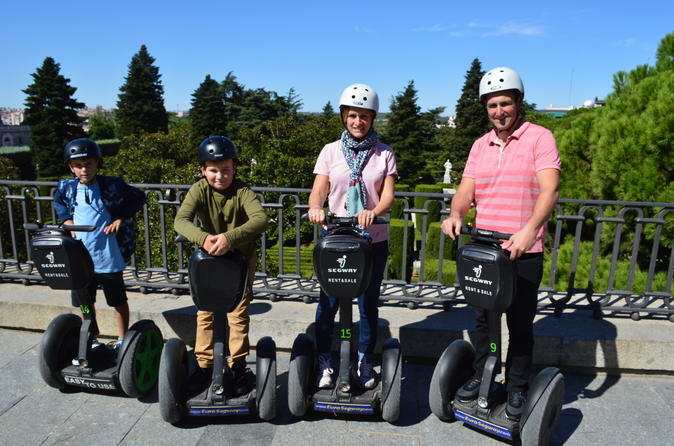 You will head then to the Egyptian temple of Debod, the oldest construction of the city. Given to Spain by the Egyptian government as a sign of gratitude, its the only one of its kind in the whole country. The temple is located in one of the highest points of the city from which we can enjoy the stunning views over the Cathedral, the Royal Palace and the biggest urban park in Europe Casa de Campo. In the way back you will have the chance to admire the Sabatini Gardens and its neo classical style and the Opera House, home of spanish and european classical theatre since nineteenth century.